UFO SIGHTINGS DAILY: Alien Outpost Found Near Mars Rover On Nov 2015, Video, UFO Sighting News. Alien Outpost Found Near Mars Rover On Nov 2015, Video, UFO Sighting News. Date of discovery: Nov 2015, but also seen about 2012. Location of sighting: Mars Gale crater. 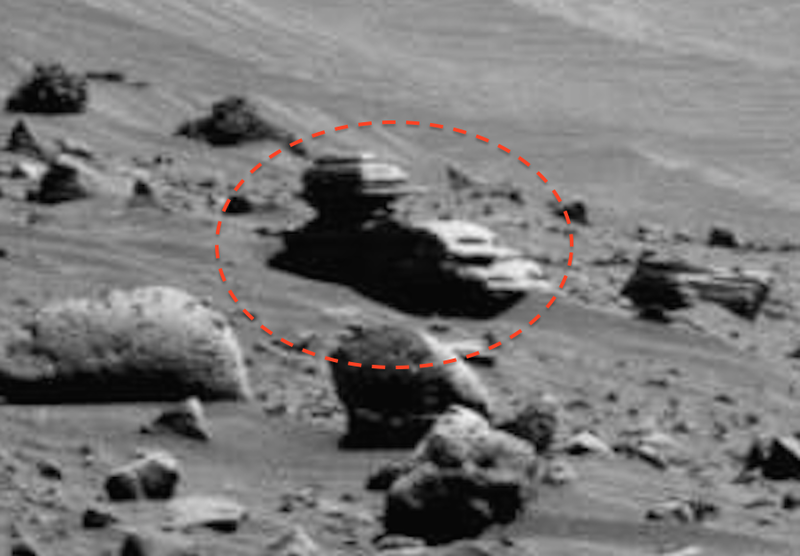 This alien structure was found by Streetcap1 of Youtube. The structure has a small tower on the back of it. This tower is symmetrical and has a metallic glint to its surface. Its size is only about 2 meters across, but some of the beings that lived on Mars were between 5 and 10 inches tall. Yes, you heard me right. Mars researchers around the globe have been finding human-like statues that range between 5-10 inches. When you find one, its just a coincidence, but when you find 20 or more, you got some serious evidence that would work in a court of law.